Central Asia, the vast landmass jostling between Europe and China, has been endlessly redefined by the great dictators of history – Alexander the Great, Tamerlane, Stalin – and through their rampages a region of enormous cultural richness has emerged. Most of the region’s peoples are hardly known in the West, and some are in grave jeopardy. Travelling by train, mule and on foot, in Out of Steppe Daniel tracks down six peoples from all across Central Asia. From the Karakalpaks, whose lives have been irrevocably altered by the desiccated Aral Sea, he meets the last Jews of Bukhara, once renowned for their polygamy (unique amongst Jews). In Kazakhstan’s northern steppes, he locates aged Volga Germans, whose 240 year old communities are all but extinct. In the peaks of Tajikistan he is welcomed by Yaghnobis, the last descendants of the fire-worshipping Soghdians, the greatest of the Silk Road traders. Hitching across the central plateau of Afghanistan, the long-marginalised Hazaras invite him to lunch in the old Buddhist niches, destroyed by the Taliban in 2001. His journey ends with the Kalashas of the Hindu Kush, followers of an ancient shamanic religion, and whose existence in fervently Islamic Pakistan hangs in the balance. This is an important book: a first hand account from an adventurous traveller who has dared to explore the fulcrum of Asian geopolitics. Read this and you will understand why we need to care about Central Asia. 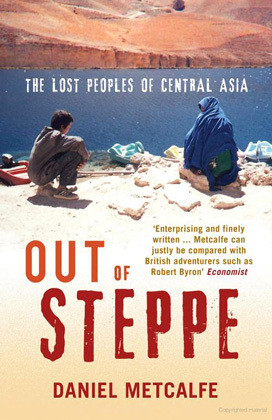 Metcalfe has reminded us of why travel-writing matters. Metcalfe writes with sensitivity and great flair. Following him across this little-known region, I was totally absorbed in his world of emirs, shamans and cynical apparatchiks. This book has many virtues, the greatest of which are courage and a keen eye for detail, plus an ability to convey the essence of a place through the briefest of anecdotes.